“MJR president John Kraus … submitted Lion FM membership applications for ECAJ president Dr Danny Lamm, JCCV president John Searle and Zionist Council of Victoria president Sam Tatarka. The executive, however, passed a resolution to defer membership deliberations – “a disgusting and disgraceful state of events”, according to Kraus, particularly given that Searle and Tatarka were present. 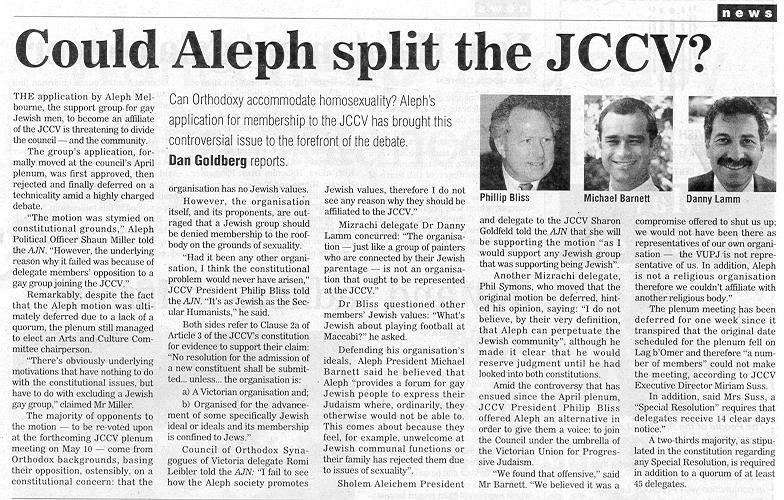 In 1999 the JCCV refused membership to Aleph Melbourne, then a social and support group for gay and bisexual Jewish men. 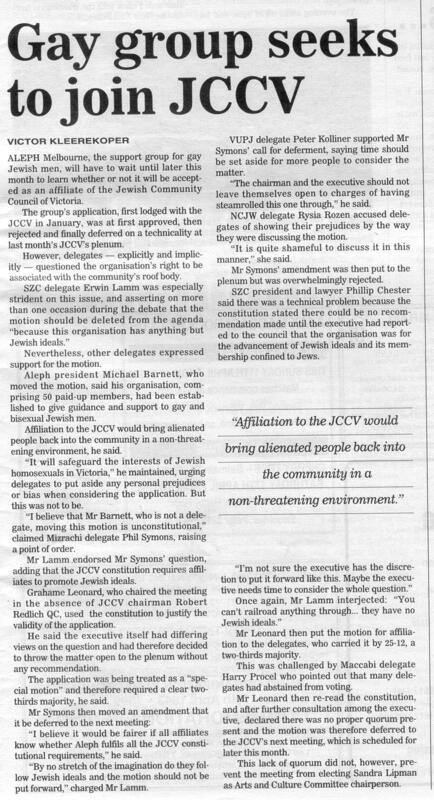 Now in 2011 the JCCV unapologetically endorses the unsubstantiated view of Rabbi Rapoport that membership of the JCCV by gay, lesbian, bisexual and transgender people in the Jewish community would be harmful to said community. In my opinion these two events overshadow the fraught membership application by the JCCV president of community radio station Lion FM. There may be meritorious reasons for Lion putting on hold the membership applications of Searle, Lamm and Tatarka. It is unhelpful that Searle endorses Rapoport’s claim the JCCV should not have GLBT membership. This action further marginalises GLBT members of the Jewish community. If any community organisation wants to be successful, it must work cooperatively with every member of the community it is a part of, not just those that fit its political agenda. It’s worth noting that in 1999 that both the State Zionist Council and Danny Lamm actively spoke against membership of Aleph Melbourne to the JCCV. If Searle, Lamm or Tatarka approached Aleph Melbourne for membership, they would be pleased to hear that membership would be approved without hesitation. Aleph Melbourne doesn’t ask questions about how prospective members bat or the way they prefer to score goals. The organisation welcomes all members of the Jewish community, with the only prerequisite being a Jewish identity or heritage. Lastly, if any of the aforementioned wish to become members of a long-standing and reputable community radio station in Melbourne, they can approach JOY 94.9. Their membership application process is especially transparent. Apply here. This entry was posted on Fri, Mar 4th, 2011 at 9:02 am and is filed under Justice. You can follow any responses to this entry through the RSS 2.0 feed. You can leave a response, or trackback from your own site.